Rotherham United went from behind this afternoon at a rainy Hillsborough to be two-one up only to let the lead slip and end up with a point. The Millers had the better of the first half and when Will Vaulks got the ball some yards out from goal and the travelling fans shouting ‘shoot’ he did just that only for Joey Pelupessy to block. Minutes later Vaulks sent Zak Vyner on his way but it came to nothing before a short throw from the Millers number four ended up going for a corner which Jon Taylor fired just wide. Anthony Forde, starting his second game in a row, and Ryan Williams saw shots blocked before a Taylor shot was smothered by Owls’ ‘keeper Cameron Dawson. The first yellow card of the afternoon went to Barry Bannan for a poor challenge on Vaulks. A foul on Richie Towell saw the Millers get a free-kick thirty yards out which was aimed towards the head of skipper Richie Wood by Forde eventually falling to Williams whose shot was blocked. 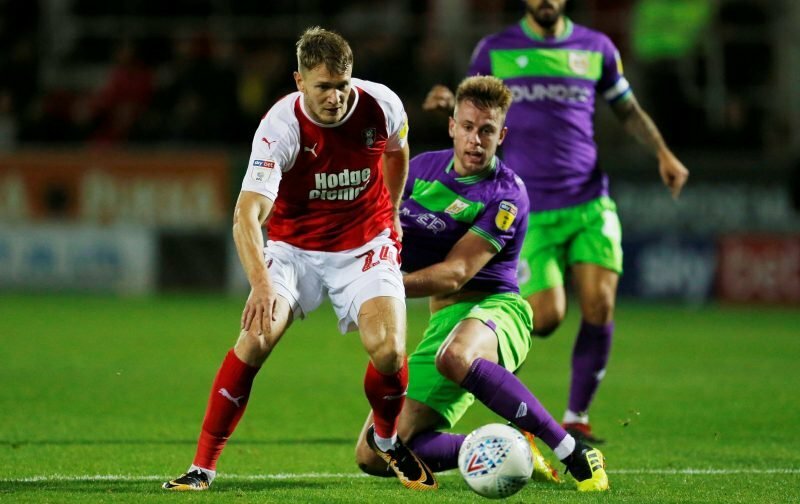 The hosts first chance of the game came just before the half-hour mark with Bannan getting the better of the Millers defence and sent the ball to Adam Reach leave Semi Ajayi behind but then dragged his shot across the face of goal – a let off for Rotherham. Michael Smith was pulled all over by Tom Lees with referee Darren Bond waving away the strikers protests but not a minute later giving a free-kick for exactly the same offence to the hosts which Bannan took and getting a corner as it came off the head of Richie Towell. Five minutes before the end of the first half a cross from Forde found Smith who brought off a great save from Dawson which fell to Joe Mattock who sent it back into the middle for Smith but he glanced the ball wide. At the other end Morgan Foxsaw a header go wide before some super work from Williams saw him get the ball to Vyner who sent a lovely cross into the box but there wasn’t a yellow and blue shirt there waiting. To say it was against run of play is an understatement in time added on when a ball found Lucas Joao and getting the better of Wood he put the ball into the corner of the net to give the hosts the lead going into half-time. Sheffield Wednesday started the second half with Daniel Pudil on for Jordan Thorniley. Less than a minute into the second half a pass from Will Vaulks left the Owls defence found wanting and Michael Smith flew down the pitch and fired into the bottom corner of the net in front of the delighted travelling fans. At the other end a superb save from Marek Rodak in the Millers’ goal denied Atdhe Nuhiu and only a good challenge on Ryan Williams by Joey Pelupessy stopped the Australian in his tracks. With ten minute of the half gone Joe Mattock and Williams worked well together to get the ball to Jon Taylor who got it out to Richie Towell who struck the ball from distance and to his delight saw Cameron Dawson dawdle a little as it seemed to stroll into the net to give the visitors the lead. The Owls looked for a penalty when Lucas Joao threw himself to the floor but referee Bond shook his head before Rodak saved well from the Portuguese international. But he couldn’t do much on sixty-four minutes when a poor clearance from Semi Ajayi fell to Pudil who found the head of Joao who made it two-two. Morgan Fox did well a few minutes later to head a dangerous cross from Anthony Forde behind with Forde’s following corner only needing a tap-in to put the Millers back in front but nobody connected. The first Millers substitute of the afternoon saw Ben Wiles come on for Forde. Rotherham really should have gone back into the lead on the seventy-sixth minute after some good work from Williams found Smith whose fantastic ball found Vaulks with an empty net in front of him but instead of just hitting it he tried for the spectacular and sent the ball wide. Joey Pelupessy was replaced by Marco Matias for the Owls. A fter a foul on Williams by Matias the free-kick from Taylor caught Dawson in two minds and when it fell to Wiles he let fly but saw the ball eventually cleared to safety. A Vaulks long-throw found Towell who put the ball over before he had a great chance to score when a Vaulks cross found Smith who gave it to the Irishman but sent his shot blazing over the crossbar when it looked easier to score. As the game came to an end Richard Wood had to be aware and head the ball behind from a Joao cross-come-shot before Reach got a ball into Nuhiu who looked odds on to give the Owls all three points but somehow missed. Once again the Millers had chance after chance and once again couldn’t put them away – we really should have gone in winning by two or three at half-time instead we found ourselves one down. And then to go in front only to let the Owls back into it – frustrating. Both teams had chances and both teams defence had moments they are going to want to forget. Was it an exciting game – yes it was.